References CONNECT_SPIN_SIGNAL_CHANGED, CONNECT_SPIN_SIGNAL_FOCUS_OUT, m_checkbuttonDomDirection, m_checkbuttonHyphenate, m_checkbuttonKeepLines, m_checkbuttonKeepNext, m_checkbuttonPageBreak, m_checkbuttonSuppress, m_checkbuttonWidowOrphan, m_drawingareaPreview, m_listAlignment, m_listLineSpacing, m_listSpecial, m_spinbuttonAfter, m_spinbuttonAt, m_spinbuttonBefore, m_spinbuttonBy, m_spinbuttonLeft, m_spinbuttonRight, s_check_toggled(), s_combobox_changed(), and s_preview_draw(). References _constructWindowContents(), abiAddButton(), abiDialogNew(), BUTTON_CANCEL, BUTTON_OK, BUTTON_TABS, XAP_Dialog::getApp(), XAP_App::getStringSet(), XAP_StringSet::getValueUTF8(), m_buttonCancel, m_buttonOK, m_buttonTabs, m_windowMain, s, and UT_XML_cloneNoAmpersands(). References XAP_Dialog::getApp(), XAP_App::getStringSet(), XAP_StringSet::getValueUTF8(), AP_Dialog_Paragraph::id_CHECK_DOMDIRECTION, AP_Dialog_Paragraph::id_CHECK_KEEP_LINES, AP_Dialog_Paragraph::id_CHECK_KEEP_NEXT, AP_Dialog_Paragraph::id_CHECK_NO_HYPHENATE, AP_Dialog_Paragraph::id_CHECK_PAGE_BREAK, AP_Dialog_Paragraph::id_CHECK_SUPPRESS, AP_Dialog_Paragraph::id_CHECK_WIDOW_ORPHAN, AP_Dialog_Paragraph::id_MENU_ALIGNMENT, AP_Dialog_Paragraph::id_MENU_SPECIAL_INDENT, AP_Dialog_Paragraph::id_MENU_SPECIAL_SPACING, AP_Dialog_Paragraph::id_SPIN_AFTER_SPACING, AP_Dialog_Paragraph::id_SPIN_BEFORE_SPACING, AP_Dialog_Paragraph::id_SPIN_LEFT_INDENT, AP_Dialog_Paragraph::id_SPIN_RIGHT_INDENT, AP_Dialog_Paragraph::id_SPIN_SPECIAL_INDENT, AP_Dialog_Paragraph::id_SPIN_SPECIAL_SPACING, m_checkbuttonDomDirection, m_checkbuttonHyphenate, m_checkbuttonKeepLines, m_checkbuttonKeepNext, m_checkbuttonPageBreak, m_checkbuttonSuppress, m_checkbuttonWidowOrphan, m_drawingareaPreview, m_listAlignment, m_listLineSpacing, m_listSpecial, m_spinbuttonAfter, m_spinbuttonAt, m_spinbuttonBefore, m_spinbuttonBy, m_spinbuttonLeft, m_spinbuttonRight, m_windowContents, s, UT_XML_cloneNoAmpersands(), WIDGET_ID_TAG, XAP_appendComboBoxTextAndInt(), and XAP_makeGtkComboBoxText(). References AP_Dialog_Paragraph::_getCheckItemValue(), AP_Dialog_Paragraph::_getMenuItemValue(), AP_Dialog_Paragraph::_getSpinItemValue(), AP_Dialog_Paragraph::check_TRUE, gchar, AP_Dialog_Paragraph::id_CHECK_DOMDIRECTION, AP_Dialog_Paragraph::id_CHECK_KEEP_LINES, AP_Dialog_Paragraph::id_CHECK_KEEP_NEXT, AP_Dialog_Paragraph::id_CHECK_NO_HYPHENATE, AP_Dialog_Paragraph::id_CHECK_PAGE_BREAK, AP_Dialog_Paragraph::id_CHECK_SUPPRESS, AP_Dialog_Paragraph::id_CHECK_WIDOW_ORPHAN, AP_Dialog_Paragraph::id_MENU_ALIGNMENT, AP_Dialog_Paragraph::id_MENU_SPECIAL_INDENT, AP_Dialog_Paragraph::id_MENU_SPECIAL_SPACING, AP_Dialog_Paragraph::id_SPIN_AFTER_SPACING, AP_Dialog_Paragraph::id_SPIN_BEFORE_SPACING, AP_Dialog_Paragraph::id_SPIN_LEFT_INDENT, AP_Dialog_Paragraph::id_SPIN_RIGHT_INDENT, AP_Dialog_Paragraph::id_SPIN_SPECIAL_INDENT, AP_Dialog_Paragraph::id_SPIN_SPECIAL_SPACING, m_checkbuttonDomDirection, m_checkbuttonHyphenate, m_checkbuttonKeepLines, m_checkbuttonKeepNext, m_checkbuttonPageBreak, m_checkbuttonSuppress, m_checkbuttonWidowOrphan, m_listAlignment, m_listLineSpacing, m_listSpecial, m_spinbuttonAfter, m_spinbuttonAt, m_spinbuttonBefore, m_spinbuttonBy, m_spinbuttonLeft, m_spinbuttonRight, UT_ASSERT, and XAP_comboBoxSetActiveFromIntCol(). References AP_Dialog_Paragraph::_getMenuItemValue(), AP_Dialog_Paragraph::_getSpinItemValue(), AP_Dialog_Paragraph::id_MENU_SPECIAL_INDENT, AP_Dialog_Paragraph::id_MENU_SPECIAL_SPACING, AP_Dialog_Paragraph::id_SPIN_AFTER_SPACING, AP_Dialog_Paragraph::id_SPIN_BEFORE_SPACING, AP_Dialog_Paragraph::id_SPIN_LEFT_INDENT, AP_Dialog_Paragraph::id_SPIN_RIGHT_INDENT, AP_Dialog_Paragraph::id_SPIN_SPECIAL_INDENT, AP_Dialog_Paragraph::id_SPIN_SPECIAL_SPACING, AP_Dialog_Paragraph::indent_FIRSTLINE, AP_Dialog_Paragraph::indent_NONE, m_listLineSpacing, m_listSpecial, m_spinbuttonAfter, m_spinbuttonAt, m_spinbuttonBefore, m_spinbuttonBy, m_spinbuttonLeft, m_spinbuttonRight, AP_Dialog_Paragraph::spacing_DOUBLE, AP_Dialog_Paragraph::spacing_MULTIPLE, AP_Dialog_Paragraph::spacing_ONEANDHALF, AP_Dialog_Paragraph::spacing_SINGLE, and XAP_comboBoxSetActiveFromIntCol(). Referenced by event_SpinFocusOut(), and runModal(). References AP_Dialog_Paragraph::_setCheckItemValue(), UT_ASSERT, and WIDGET_ID_TAG. References AP_Dialog_Paragraph::_setMenuItemValue(), UT_ASSERT, WIDGET_ID_TAG, and XAP_comboBoxGetActiveInt(). References AP_Dialog_Paragraph::_setMenuItemValue(), UT_ASSERT, and WIDGET_MENU_PARENT_ID_TAG. References AP_Dialog_Paragraph::_setSpinItemValue(), _syncControls(), gchar, m_bEditChanged, and WIDGET_ID_TAG. 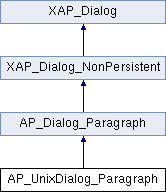 References XAP_Frame::getCurrentView(), AP_Dialog_Paragraph::m_answer, AP_Dialog_Paragraph::m_pFrame, and s_doTabDlg(). References _connectCallbackSignals(), _constructWindow(), AP_Dialog_Paragraph::_createPreviewFromGC(), _populateWindowData(), _syncControls(), abiDestroyWidget(), abiRunModalDialog(), BUTTON_CANCEL, BUTTON_OK, BUTTON_TABS, event_Cancel(), event_OK(), event_Tabs(), XAP_App::getApp(), AP_Dialog_Paragraph::id_MENU_ALIGNMENT, m_drawingareaPreview, AP_Dialog_Paragraph::m_pFrame, m_unixGraphics, XAP_App::newGraphics(), and UT_ASSERT. Referenced by AP_UnixDialog_Paragraph(), event_SpinChanged(), and event_SpinFocusOut(). Referenced by _connectCallbackSignals(), _constructWindowContents(), and _populateWindowData(). Referenced by _connectCallbackSignals(), _constructWindowContents(), and runModal(). Referenced by _connectCallbackSignals(), _constructWindowContents(), _populateWindowData(), and _syncControls(). Referenced by AP_UnixDialog_Paragraph(), runModal(), and ~AP_UnixDialog_Paragraph().